The 2016 ONA Convention will be held at the Seaside Civic & Convention Center in Seaside on April 11-13, 2016. The first day, Monday, April 11, was be a half-day nurse staffing workshop. This workshop featured presentations and information to help nurses better understand the updated Oregon hospital nurse staffing law and improve staffing in their workplace. The second day, Tuesday, April 12, was a full day of continuing education sessions with topics ranging from the use of social media, nurse advocacy, collective bargaining tools and skills, effective communication, ethics in nursing, nurse leadership and more. The third day, Wednesday, April 13, was the ONA House of Delegates. NOTE: Presentations and slides are available only for those sessions that have provided them and have allowed for them to be shared. Slides: "Errors of Omission: Missed Nursing Care"
Slides: "Oregon’s Nurse Staffing Law: Governance and Oversight"
Please see the individual session objectives listed for each presenter from the schedule below. The session objectives will be posted as they are finalized. Learners can earn up to 9.5 continuing nursing education contact hours. Participants who successfully complete the above requirements will receive a Certificate of Successful Completion from ONA for the contact hours claimed during the evaluation process. Participants should only claim the sessions which were attended in full. NOTE: Please plan on completing the evaluation in one sitting after attending all of the sessions you plan on earning CE for. You cannot save the evaluation and then return to complete it later. All faculty/presenters for this activity have attested that she/he will provide the best available evidence for this content and present information fairly and without bias. For individual written disclosures from faculty presenters, please see the individual session description disclosures found with the course description and objectives, linked in the schedule below. Online registration is now closed. Onsite registration will be available at the event. * Join ONA while registering and save on fees (one year membership required). ONA Retired Members may attend all three days of the Convention for only $25. 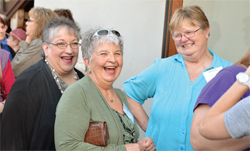 ONA 50-year Members may attend all three days of the Convention for Free! An administrative fee of $25 will be deducted from all refunds if written cancellation is received before April 4, 2016. Cancellations received after April 4, 2016 or no shows, will NOT receive a refund. To provide the best experience possible for our attendees, ONA is introducing a mobile event app for smart phones and mobile devices, which can also be accessed through desktop and laptop computers. The ONA Convention mobile app will put all of the conference details, documents and information in the palm of your hand, allowing for an interactive experience that will enhance the learning opportunities and provide more opportunities to interact with your colleagues. The mobile app will be available for download closer to the time of the convention. Registered attendees will receive an email with instructions on how to download and install the mobile app at that time. ONA would like to invite all convention attendees to a reception on Tuesday night, April 12, from 7-10 p.m in the Pacific Room of the Seaside Convention Center. This is a great opportunity to visit with your colleagues and get to know your fellow ONA members! More details will be provided closer to the event. ONA is proud to present the 2016 Quilt Raffle to raise funds for the Oregon Nurses Foundation to be used toward future scholarships! Titled "Friends in the Garden at Night," it is approximately 84" x 84" and features a hanging sleeve on the back to allow it to be hung or used as a bed quilt. 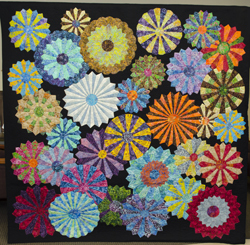 The quilt is composed of 32 "Dresden plates" made from batik fabrics that are appliquéd on a black background. The quilt was made by ONA Board of Directors Secretary Diane Hedrick, RN and was machine quilted by Carolee Engelson, a retired RN from Grande Ronde Hospital. Raffle tickets will be sold at the ONA Convention and the raffle drawing will happen near the end of the House of Delegates on April 13. Raffle tickets are $5 each or you can get 5 tickets for only $20! The tentative convention schedule can be found below and is subject to change. 201: Anti-Worker Attacks: What’s at Stake? Brittney Wilson, BSN, RN, "The Nerdy Nurse"
ONA has blocks of rooms at the Holiday Inn Express & Suites near the Seaside Civic and Convention Center that convention attendees can contact to reserve a room. There are also other hotels, listed below, that are near the convention center that will provide discounted rates to ONA Convention attendees. Included in all of guests’ stay will be the following amenities: full (hot) continental breakfast, warm cookies in the lobby at 6pm every evening, a 24-hour pool and hot tub area for those 21 years old and older (6 a.m. - 10 p.m. under 21 years of age), 24 hour per day fitness center with all new equipment and televisions, newspapers available in the lobby on weekdays, wi-fi access to all guests, plus a 24-hour front-desk that is staffed around the clock to make sure that your attendees are always taken care of and treated like they are at their home away from home. Plus, we are just directly across from the Seaside Convention Center and only a few blocks from the beautiful Seaside Beach. 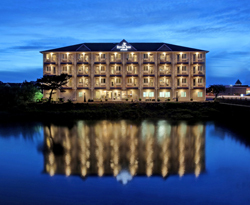 "Check into the Rivertide Suites Hotel and discover upscale accommodations in a beautiful riverside setting. 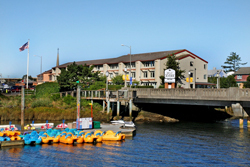 Ideally situated on the Northern Oregon Coast along the shimmering Necanicum River, our Seaside, OR hotel is within walking distance of the area's finest beaches, restaurants, shopping venues and attractions. It's also a welcoming resort-style lodging facility with first class service and amenities." "The Beachside Inn offers unpretentious, casual lodging to beach loving travelers. Nestled in a relaxed seashore community, you will find BEACHSIDE INN reminiscent of the beach bungalows of summers long past. The Inn is meticulously clean, comfortable & cozy. We’re less than a block to the beach and walking distance to downtown (4 blocks). You won’t need a car to enjoy Seaside." Located across the street from the Seaside Convention Center, the Inn at Seaside offers an indoor pool, refrigerators, microwaves, coffee services, free Wi-Fi & complimentary deluxe continental breakfast. Check in at 4:00 p.m. and check out at 12:00 p.m.
River Inn at Seaside offers a fitness room, state-of-the-art saltwater indoor pool, complimentary deluxe continental breakfast and so much more.